Magazines afford us the most delightful reading of all: great storytelling. Stories shared in publications such as Northwest Quarterly are about business, life, weddings, shopping, food, fun, travel, people – nearly every facet of life. Every individual has a unique experience in life, business, education and community service. Those life experiences can inspire others through some basic storytelling. Philanthropists often ask to remain anonymous because they don’t make contributions for the publicity. However, learning the story of a philanthropist and their reason to give may motivate others to make a difference. Business is often started by an individual with a passion; a great idea, great product, great service. Each of these businesses has a story – a personal story. We’re fascinated by television shows like “Shark Tank,” where an entrepreneur tells his or her story and sells an investment based on that narrative. The inventor of fire must have loved telling his or her friends how the smoke and heat were magically called forth when sticks were rubbed together. Then the fire maker had to determine the right price and delivery method for this new utility. What a great story that must have been. Rather than filling your website with corporate-speak and talk of missions and visions, consider presenting the story of your passion and your business. More memorable than bullet points and catchy taglines, stories can bring your audience back again and encourage them to send others to you. Could Your Story Change a Life? The enthusiasm expressed in a life-changing story may enable another person to refocus their energies and improve their business and/or life. Associated Electrical Contractors, in Woodstock, is sparking new ideas for managing its business through technology, efficiency and funding, with a strong focus on lighting the Woodstock Square for the holiday season. New managing members restructured the business two years ago to provide a rebirth of the 25-year-old operation. Bill Wolfe is owner of ASR Events. His story is one of leveraging a fun time to generate an ongoing business. The Abominable Snow Race was born in less than eight months. More than 1,100 obstacle course racers from around the country took on a 3.5 mile course with 20-plus obstacles at Veteran Acres Park, in Crystal Lake, on Jan. 26, 2016. Wolfe was invited to move the race to Grand Geneva Ski Resort, in Lake Geneva, this year. Held on Jan. 28, 2017, this year’s race drew more than 2,500 racers who trekked through 4.4 miles while passing 24 obstacles in beautiful snowy conditions. 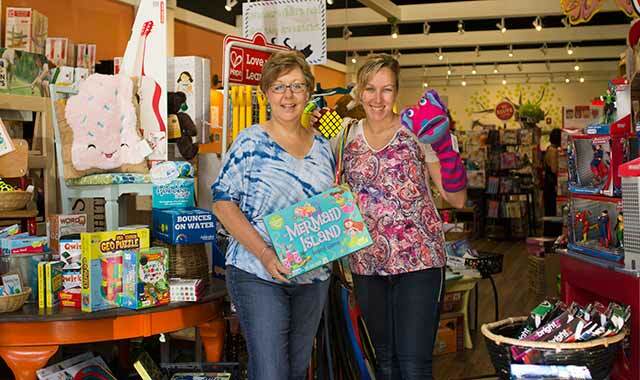 Marvin’s Toy Store, in Crystal Lake, was founded by Lori McConville and her daughter Kate in 2013. The teacher-turned-tutor wanted an eco-friendly, educational and fun toy store. She explored many locations, product assortments and business strategies. Her passions for education and sustainability were embraced by families in the region, who now travel 5, 10 and sometimes 25 miles or more to experience the joy, innovation and imagination of Marvin’s Toy Store. Elgin Medi-Transport Inc., of Elgin, is an ambulance and wheelchair transport company serving northern Illinois. Pat Crawford has a memorable story. He was an Elgin firefighter who chose to be in the first paramedic EMT training in Illinois. In 1977, his entrepreneurial spirit inspired him to start Elgin Medi-Transport. He is still a licensed paramedic. With changes happening in the world of health care coverage, Pat and his crews are exploring new ways to deliver quality health care support. Tell your story with your authentic enthusiasm. Put it out there to help others understand your purpose, create a point of reference or inspire others to participate and grow. By clearly articulating what your business is about, you will better attract and engage the best clients, vendors and employees. This entry was posted on Wednesday, February 15th, 2017 at 11:58 am	and is filed under Northwest Business Magazine. You can follow any responses to this entry through the RSS 2.0 feed. Both comments and pings are currently closed.